"As a Franchisor with hundreds of offices around the country and globally, we were faced with amixed bag of challenges to provide our existing and new franchise locations with promotional items. Quality items, competitive pricing, variety, stocking, reordering, availability, delivery and customer satisfaction were all challenges that we had... and that were growing as we added nearly 100 new offices per year. 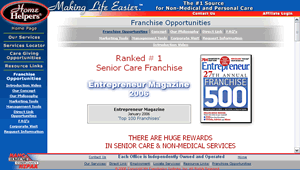 Palmer Promotions' on-line store effectively addressed each of those challenges for the Home Helpers and Direct Link franchise systems by relieving my staff from dealing with these issues in supporting our franchisees with promotional items. This has allowed my staff to focus on franchise development and support activities, thereby adding tremendous value to Home Helpers."